A postcard depicting the Clearwater Marina, also known as the Clearwater Beach Marina, located at 25 Causeway Boulevard in Clearwater, Florida. Present-day Clearwater was originally inhabited by the Tocobaga. The U.S. Army began construction of Fort Harrison around 1835 to serve as an during the Second Seminole War. The area, which was then known as Clear Water Harbor, experienced significant growth following the passage of the Federal Armed Occupation Act of 1842, which offered land to settlers who would bear arms and cultivate the land. In 1888, the Orange Belt Railway added an extension into Clearwater, adding to the town's growth. In 1891, the Town of Clearwater was incorporated with James E. Crane as its first mayor. In 1897, Henry B. Plant (1819-1899) built his Belleview Hotel, thus allowing Clearwater to become a popular vacation destination. Clearwater was designated as the county seat for Pinellas County when it seceded from Hillsborough County in 1912. In 1915, Clearwater was a reincorporated as a city in 1915. During World War II, the city became a major training area for American troops. Original 9 x 14 centimeter color postcard by Tichnor Bros., Inc.: Private Collection of Bob Van Horn. Digital reproduction of original 9 x 14 centimeter color postcard by Tichnor Bros., Inc.. Originally created by Tichnor Bros., Inc.
"Clearwater Beach Marina." MyClearwater.com. http://www.clearwater-fl.com/gov/depts/marine_aviation/ma_facilities/marina/index.asp. 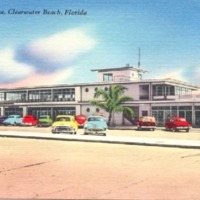 "History of Clearwater." Clearwater Regional Chamber. http://www.clearwaterflorida.org/Relocation/history.aspx. Tichnor Bros., Inc.. “Clearwater Marina Postcard.” RICHES of Central Florida accessed April 26, 2019, https://richesmi.cah.ucf.edu/omeka/items/show/7553.